There is no precise English equivalent for the Dutch verb tasten, a word that could be compared to “groping,” or the action of searching with ones hands in the dark. Seeing Away explores a perceptual process that amalgamates several senses: sight, taste, and touch are unified, producing an unexpected experience of familiar objects, environments, and communication modes, defamiliarizing the spectators to their environment. 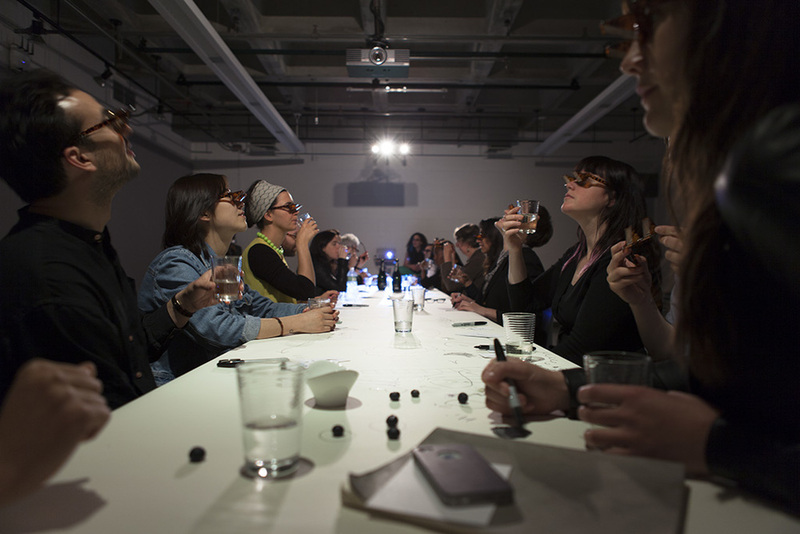 Participants wear special spectacles, so-called "bed specs" – spectacles designed for reading in bed whilst lying down – and engage with food, writing tools, and other everyday objects. Elaine Buckholtz is an installation artist with a background in lighting design. Her work explores the medium of light as both an ephemeral phenomenon and as an intervention to unmask hidden aspects of architectural forms found in urban settings and landscapes. She has shown work at The Lumiere Festival, Derry Ireland, Souzy Tros, Athens Greece, Back Yard Stories, Batumi, Georgia, Electric Works Gallery and The Luggage Store Gallery, SFAC, Yerba Buena Center For The Arts, San Francisco, California, The Claremont Museum in Southern California, Pierogi Leipzig, Leipzig Germany and The Swiss Technorama Museum, Winterthur Switzerland. Elaine has also worked with Meredith Monk for the past fourteen years lighting her work internationally. South African artist Floor van de Velde creates installations and audio-visual environments that combine sound, video, electronics and light. She holds a BFA in Sculpture from the Massachusetts College of Art and Design and a Master in Science at the Program in Art, Culture & Technology at MIT. Floor has studied, lived and worked in South Africa, Belgium, the United Kingdom, France and the United States. With a background in graphic design and training as a classical violist, she gravitates towards precision-oriented, systematic, and modular approaches to art-making. Through the manipulation of projected light, abstract moving imagery and adapted surfaces, Floor creates immersive installations – ranging from discrete interventions to room-size installations – that confound the viewer’s sense of perception and depth of field and activate space.